Analytics helps you measure your users, product, and business. It unlocks insights into your app's funnel, core business metrics, and whether you have product-market fit. Collect analytics data from your app(s). The top 200 Segment companies collect data from 5+ source types (web, mobile, server, CRM, etc.). Send the data to analytics tools (for example, Google Analytics, Amplitude, Mixpanel). Over 250+ Segment companies send data to eight categories of destinations such as analytics tools, warehouses, email marketing and remarketing systems, session recording, and more. Explore your data by creating metrics (for example, new signups, retention cohorts, and revenue generation). The best Segment companies use retention cohorts to measure product market fit. Netflix has 70% paid retention after 12 months, 30% after 7 years. 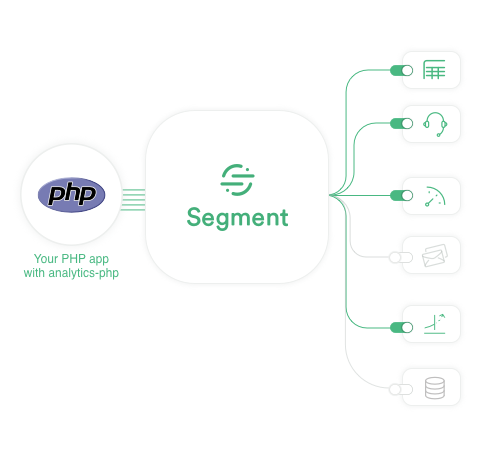 Segment collects analytics data and allows you to send it to more than 250 apps (such as Google Analytics, Mixpanel, Optimizely, Facebook Ads, Slack, Sentry) just by flipping a switch. You only need one Segment code snippet, and you can turn integrations on and off at will, with no additional code. Sign up with Segment today. Power all your analytics apps with the same data. Instead of writing code to integrate all of your tools individually, send data to Segment, once. Install tracking for the last time. We're the last integration you'll ever need to write. You only need to instrument Segment once. Reduce all of your tracking code and advertising tags into a single set of API calls. Send data from anywhere. Send Segment data from any device, and we'll transform and send it on to any tool. Query your data in SQL. Slice, dice, and analyze your data in detail with Segment SQL. We'll transform and load your customer behavioral data directly from your apps into Amazon Redshift, Google BigQuery, or Postgres. Save weeks of engineering time by not having to invent your own data warehouse and ETL pipeline. If you are part of a new startup (<$5M raised, <2 years since founding), we just launched a new startup program for you. You can get a Segment Team plan (up to $25,000 value in Segment credits) for free up to 2 years — apply here!